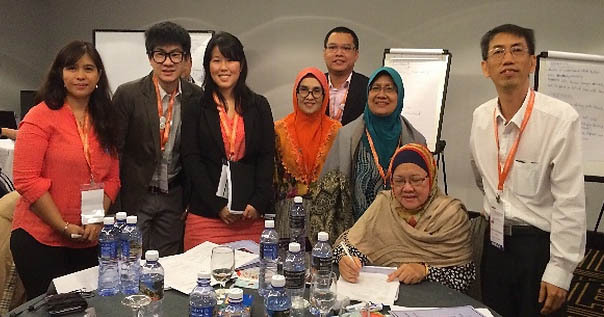 Malaysian Rare Disorders Society (MRDS) participated in the ‘Love Is Not Rare’, Rare Disease Asia Conference 2015 (Conference) held in Singapore from 12-13 March 2015. The Conference was organized by Rainbow Across Borders. MRDS president, Dato ‘ Hatijah Ayob and administrative officer, Ms Hanna Ong joined other patient groups’ representatives from the Asia Pacific region for the conference. The Conference began with the opening address from Prof Denise Goh from the National University Hospital, Singapore followed by Mr Gregory Vijayendran, President of Club Rainbow (Singapore). Prof Tarun Weeramanthri of the Department of Health, Western Australia in his keynote address spoke about the Western Australian experience in promoting a national rare disease policy and identified strategies on how to initiate this in other public health systems. The topic, “Care for Diseases: The Medical Perspective” was discussed by a panel of medical experts from the Asian countries while the topic, “Supporting Family Caregivers in Providing Care’’ was discussed by a group of professionals comprising of genetic counselors, medical social worker, welfare service providers and doctors. Prior to the Conference, a pre-conference workshop was held where participants learned how to achieve high impact results by communicating effectively to potential donors and volunteers. From the Conference, MRDS had gained not only in-depth information about the rare disease situation in the various Asian countries but also established relationships with new networking partners. Participants from Malaysia: Members from MRDS, Malaysia Lysosomal Diseases Association and Malaysia Metabolic Society together with Datuk Azman Abu Bakar, MOH Malaysia and the Conference Organising Chairman, Mr Rajakanth R.
Group discussion with representatives from Philippines, Thailand & Malaysia.